We are the Rockingham Lace Makers and Rotherham Lace Club. We offer a friendly get together for lace making with tuition if wanted. Beginners follow a set course to cover basic techniques then follow their own choice of lace. Experienced lacemakers may discover new techniques or explore a different lace and definitely meet fellow enthusiasts. We also visit trade fairs, exhibitions etc. The classes mainly cover BOBBIN LACE and TATTING but help is given in other types such as crochet, needle lace, Romanian Point, Carrickmacross etc. Classes run weekly at Wath upon Dearne, Rotherham and Hoyland. These run all year except for Bank Holidays, except at Wath where they fit in with school terms. 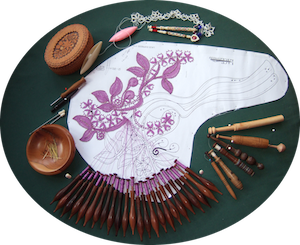 To cover running costs there is a fee of about £3.00 per weekly session for the Wath and Rotherham Lace Club classes, paid in full at the beginning of each term. The fee for the Hoyland class is £4.00 each time you attend. Bring any equipment you may have. But if you do not own any we recommend not buying any until you have a good view of what is involved – there is too much rubbish equipment available for sale and it is easy to waste your money. For the first few times you come we can lend you equipment for use in class. We have some bobbins, shuttles, beads, threads, books etc for sale; and catalogues that enable you to order equipment. The ROCKINGHAM CRAFT GROUP also meets socially the first Friday of each month, 7-9pm, at the United Reform Church Hall, to chat and enjoy other crafts as well as lace. See the Venues page for directions.